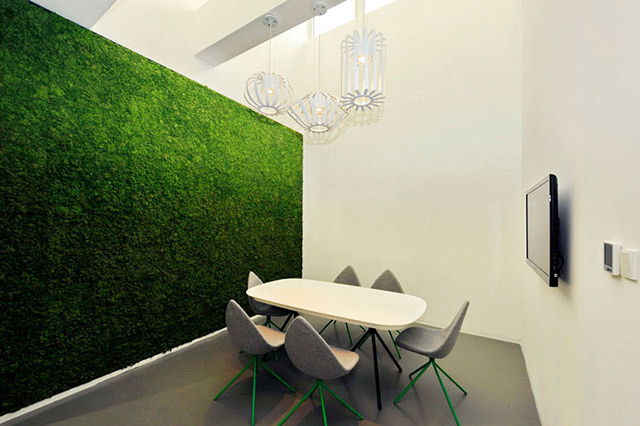 Extremely effective at absorbing noise, especially in the range of the human voice, Acoustic Moss Panels™ are an ideal material for use in offices and meeting rooms to reduce noise pollution. They can also uniquely filter toxins out of the air, while requiring virtually no maintenance or up-keep. Acoustic Moss Panels™ are made from Reindeer Moss (Cladonia Stellaris) which is hydroscopic. It has no roots and absorbs moisture and nutrients through the air. Sound Absorption: Utilizing the natural beneficent sound absorbing properties, the Acoustic moss has a .95 Sabin rated absorption at 5000Hz. Filters airborne toxins & dust out of the air through a constant cycle of absorption and release. Hypo-allergenic - the Acoustic Moss Panel™ is made without the addition of toxic hazardous chemicals to preserve or dye and is non-allergenic. Colour Fast: Moss colours are sealed permanently using an all-natural mineral process. This prevents the moss from fading and allows it to be resistant to discoloration for a limitless time. Organically grown and sustainably harvested, certified and approved by ISO 9001 and ISO 14001 standards. Acoustic Moss Panel™ does not require sunlight or pruning. Watering will cause the Moss to lose its hydroscopic properties.